Commonwealth Games 2010 saw a grand opening in Delhi a couple of hours ago. All the controversy that surrounded it was kept aside as people witnessed most spectacular show ever. * United States – Video Sound Inc.
Here’s to next 13 days of rigorous games, fun, and party! William Dalrymple’s love for India is not unknown. He has penned six books, of which five have embraced Indian life as their storyline and have been award winning. India has sewn itself into his life since long now with him spending a lot of time in New Delhi India apart from London and Edinburgh. However, since last couple of years Jaunapur (a small village on the outskirts of Delhi) has been home to the the author and his family. Delhi has been the backdrop for many of Dalrymple’s books including The Last Mughal, a prizewinning account of the Indian uprising of 1857, and the fall of the Mughal dynasty. The book has sold more than 100,000 copies worldwide. 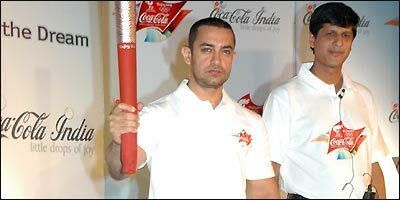 Aamir Khan, accompanied by five other torchbearers Dr. Narayan G Hegde- President, BAIF Development Research Foundation, Dr. Kiran Bedi – noted officer in the Indian Police Service (IPS) and founder Navjyoti foundation, Ravi Singh- Secretary General & CEO, World Wildlife Fund India and Atul Singh, President & CEO, Coca-Cola India. Y. Subhash Chandra Reddy- environment champion, will bear the Olympic torch in Delhi on the 17th of April.